Although spina bifida is one of the most common, permanently disabling birth defects, most people know very little about it. Many families affected by spina bifida are working on finding ways to help redefine it. Over the past three years, my son Chance has inspired me in ways I never imagined possible, something all parents of a child with spina bifida might say about their child. As a photographer, I found myself documenting his life and learning that he was born perfectly made, despite the imperfections we once feared. Over the past three years, my son’s story has inspired many, and I’ve come to meet so many other families affected by spina bifida. In 2011, I began to photograph other children born with spina bifida in hopes of creating awareness and supporting our local spina bifida community. I hope that by sharing some information about spina bifida, along with some of the images captured over the past three years, that I might be able to further redefine spina bifida. Hopefully, this may help you learn a bit more about this birth defect that affects more than 166,000 Americans. Most individuals born with spina bifida face mobility challenges. Usually, the severity of mobility loss is based on the location of the child’s lesion on their spine, how large it is and how many nerves it may have impacted. Spina bifida is often referred to as a “snowflake condition,” meaning that no two individuals will ever be impacted identically. Many parents fear that their children born with spina bifida may never walk, and it’s true some are born paralyzed due to their birth defect. 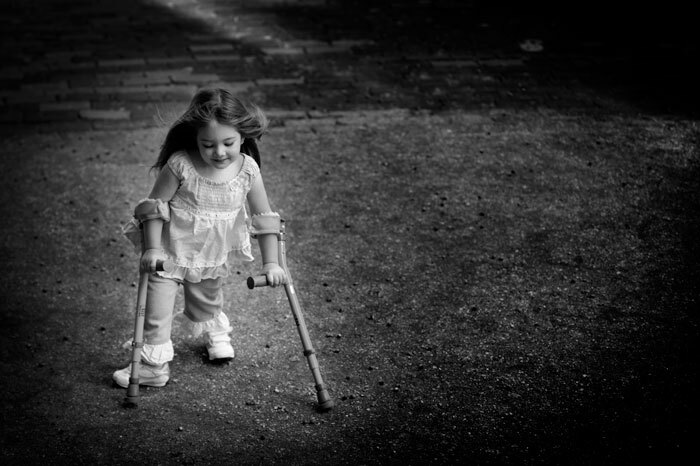 But just because someone has spina bifida does not mean they will never walk. Many children born with spina bifida require braces, walkers or a wheelchair for mobility. Children born with spina bifida can attend regular physical therapy to help build the strength in their lower extremities. Sometimes, living with spina bifida is part of what makes them more determined individuals. All of the challenges they might experience with their mobility won’t keep them from living a great life. Those who are able to take steps without support certainly learn to appreciate every single step. Spina bifida is a complex birth defect, and though a person may have mobility early in life, more complicated surgeries may be required on the spine, which may further impact their mobility. These kids are also some of the bravest kids I’ve ever met. Some children only require one or two surgeries when they are first born, and others end up needing many more surgeries and spending countless nights in the hospital. Children with spina bifida are often blessed with families who provide the most unconditional love for their children. All of the medical moments along the way can be trying, but sometimes it helps remind us what’s most important in life and bring us closer to one another. It’s easy to fear how having a child with spina bifida might impact a family. The children with spina bifida I’ve known have some of the most loving, protective and dedicated siblings. I’m often reminded that the joy within a child with spina bifida is often what gives us the strength to get through the trials that come with living with spina bifida. One thing is for sure: Children with spina bifida are just as beautiful as any other child. Some may question the quality of life of a person living with spina bifida. Children born with spina bifida often go on to lead amazing lives, and hold careers as doctors, teachers, nurses, musicians and writers. Many born with spina bifida are also among the most ambitious and adventurous individuals I’ve ever met. Some children born with spina bifida are known to experience learning challenges, but I find they are some of the most curious and brilliant minds. The children born with spina bifida I’ve met are also some of the happiest kids. Regardless of how many medical moments they may endure, they are almost always found smiling. I’ve given you so many hopeful things that help you realize these kids really are amazing, right? They really, truly are. It’s much easier to create optimism once you’ve had, or come to know a child with spina bifida. But when a parent is expecting a child with spina bifida, it seems like one of the most heartbreaking diagnoses a person can receive. Most parents only dream of having a perfectly healthy baby. No one ever dreams of having a child with spina bifida. Along with the diagnosis brings instant fear of what may be “wrong” with their baby. But, just because a baby is born with a birth defect doesn’t mean they won’t still lead an amazing life. Yes, it’s true – they may require additional care. Children born with spina bifida have 13 times greater medical expenses than the average child. In addition to mobility and learning challenges, individuals born with spina bifida are often born with bladder and bowel challenges, curvature of the spine or scoliosis, and some experience osteoporosis later in life. Unfortunately, spina bifida has no cure. A person born with this birth defect will endure the complications of living with it for their entire life. I want to encourage you to help embrace those who are born with spina bifida. The next time you learn someone was born with spina bifida, don’t ask “what’s wrong” with the person – instead, try to recognize that they are just as amazing as any other person. To see more pictures, check out Redefining Spina Bifida. Editor’s note: Originally, this story indicated that spina bifida is the most common, permanently disabiling birth defect. This is what the Spina Bifida Association says: “Spina bifida is the most common permanently disabiling birth defect in the United States.” According to the CDC, “CP [cerebral palsy] is the most common motor disability in childhood.” Based on this, we updated the story to reflect that spina bifida is one of the most common permanently disabling birth defects. For more information, visit the original post on Illuminate.